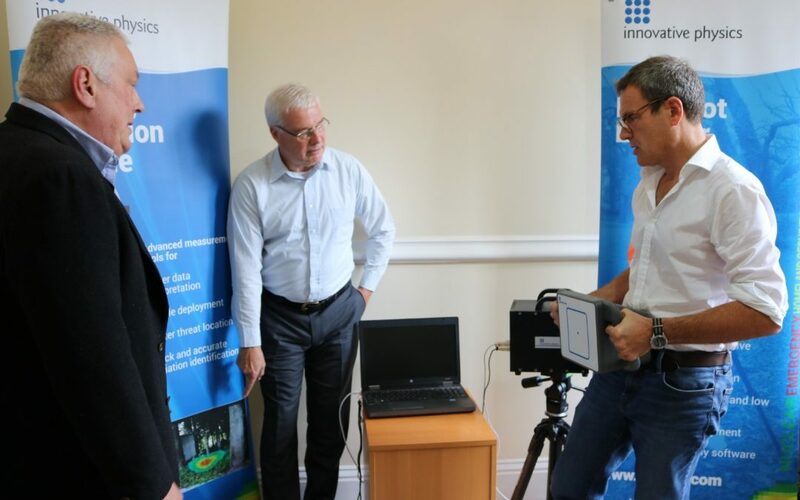 Isle of Wight MP, Bob Seely has met with Island technology company Innovative Physics – the company responsible for bringing £15 million of investment to the Isle of Wight through their successful export business based around the use of artificial intelligence and sensor solutions. The company, founded ten years ago by Mike Anderson and David Prendergast, works predominantly in the nuclear, homeland security and medical sectors providing solutions to complex problems using sensor technology, artificial intelligence and pattern recognition. The small team of highly qualified people based at Landguard Manor in Shanklin, work with foreign governments and business leaders across Asia, Europe and the USA and have been involved in many significant and wide-ranging projects. During his visit Mr Seely heard about one such project involving work to assist the decontamination following the catastrophic Fukushima tsunami and the subsequent nuclear accident in Japan in 2011. Radioactive material was released when the plant reactors exploded following the Tōhoku earthquake and tsunami, leading to the mass evacuation of the area. He saw first-hand the equipment developed by Innovative Physics which is enabling those working on the ground to rapidly and accurately detect radioactive sources in the area. The MP also heard about how similar software applications are also being used by the company to help in the faster detection and medical diagnosis of lung cancer and prostate cancer, working with the pharmaceutical market together with other business engineering solutions to help with border, airport and large-scale event security. Bob Seely, MP said: “I’m delighted to have met a company like Innovative Physics that have clearly made such a success of their business on a global scale, offering a unique approach to the use of artificial intelligence to help governments, pharmaceutical companies and businesses – all from their base here on the Island.